Although gaming can be a solitary experience in a big way, as the industry has grown, so has its audience, and the social aspect of what has now become a multi-billion dollar market has grown along with it. Lugging around a case modded to be shown off at a LAN party is part of what got me into building my own PCs, and with LAN parties and multiplayer gaming at social events becoming more and more popular, having your very own PC inside a more manageable package is something many people prefer. Board makers have risen to the occasion, and we now have all sorts of mITX board products available to us today, in a variety of colors and across several platforms. While I spent considerable time testing past mITX boards, little tiny things that could overclock better than much larger boards and came with a list of features as small as their size, not every board I played with made it onto these pages. We got a whole new platform to play with before I could get through them all, and so it begins again. Since Intel's latest offer is not all that new, board makers have happily taken the opportunity to invest time and money into refining what they already had instead of introducing a bunch of brand-new things. Such refinement is pretty darn exciting to me because many of the things I heard people asking to be changed and improved have been, although some of those changes have been met with a fair bit of ire I can completely understand. To put it mildly, some changes are pretty crazy. 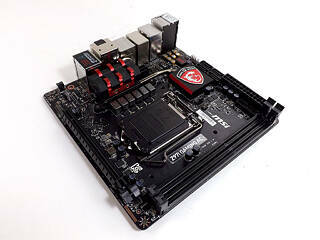 One of the brands that has definitely caught my attention over the last couple years is MSI. While MSI is not the favorite on the market as ASUS obviously commands the lion's share of the enthusiast space, MSI's products and designs have gone from being average to threatening ASUS's lofty perch, and in a way to have definitely caught my attention, never mind the attention of others. MSI has become more focused and attuned to exactly meeting its users wants and needs, with a clear divergence between products lines cleverly offering users only what they need. The Z97I GAMING, as its name proudly proclaims, is a tiny GAMING-focused motherboard destined for LAN boxes and portable desktop machines. Packed with everything you would expect from a much larger GAMING-featured product, the MSI Z97I GAMING has quickly become one of my own personal favorites. Let me show you why.